Spring… is in the air. Literally, IN the air! Everything outside right now is covered in about an inch of yellow pollen. 🙂 But that is ok, we are just keeping the windows closed, waiting for rain, and enjoying the flowers and green trees that the pollen is bringing. It is just a grouping of all kinds of things I pulled from around the house and from my décor stash that looked springy. And of course most everything up there is a yard sale or flea market find. Wow, didn’t realize that until I saw it all together. I made the spring banner. Here is how I made the banner. I saw this banner over at Adventures in Decorating and was surprised when I clicked over to her site to see that she bought it. Recognize the mirrored paned window? Yep, it was my $3 flea market find from a few weeks back. He has already gotten a fresh coat of white paint and I am loving him layered on top of the my large no-paned window. So there is my Spring mantel! I am heading over to link this up at Layla’s Spring mantel party and Kate’s Spring craft party! So if you want even more spring mantel or craft inspiration come check out some awesome links over there later. 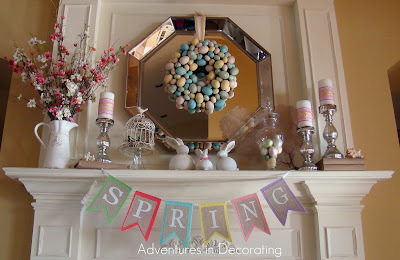 And if you have done a spring or Easter mantel – link it up in the comments and I will come over and visit and check it out! Looks great. I’ve gotta find some old windows. I adore them. Btw, love the new header. If you have any kind of flea market, junk store, whatever check there. The one on my mantel I paid for. I have about 3 other rougher looking ones I dug out a trash pile at the flea market. Then last week there was HUGE stack of windows at the flea market and he only wanted $1 each. But they were just the 2 pane ones – I really wanted the 6 pane ones. Do you yard sale at all on Saturdays, Heather? It is gorgeous! Always love seeing pictures of your creations! Great job! This is really beautiful! I hope you will link up with my Hippity Hop Easter Project Hop. This is beautiful! I love it – and I’m your newest following. I LOVE this mantel! Just shared it on our FB page! Thanks for the inspiration, Becca! I never did see that banner for sale at my Target but as soon as I saw it on your mantel (I think I found it pinned on Pinterest, actually) I knew that was what I wanted to do. So thanks for the idea! 🙂 and thanks for visiting!